This year’s summer sports season was prolonged until the middle of September, as the Noosphere Volley Beach IT Cup 2017 took place on September 16-17. This was the second annual beach volleyball tournament for Ukrainian IT specialists, organized with support from Association Noosphere and Max Polyakov. Participants competed on the volleyball grounds of the Monastic Island on river Dnipro. 27 teams from all over Ukraine took part in the competition. The teams were comprised of 63 participants from 23 companies and startups, such as Daxx, EPAM Systems, 111 Minutes, ISD, Renatus, EOS, Verta Media, Ciklum, GDM Group, Space Systems Engineering, PrivatBank, Murka, Together Networks, and many others. Freelancers were also welcome at the tournament. The high number of people interested and involved was a surprise both for players and the organizers. For instance, 11 teams took part in the tournament Dnipro Summer IT Cup 2016, which was also organized by Noosphere Association. We hope that next year the number of participating teams will increase even more. The high interest in the tournament is a good indicator of both the high quality of organization at the tournaments, and that the event is truly needed. The first tournament day marked the severe group stage in a round-robin format, as only 16 teams made it to the Play Offs. On the second day, winners of the group stage entered Playoff and competed for prizes in single elimination format. The rest of the teams played off places from 17 through 27 in a round-robin. Given so many teams participating in the tournament, teams played all the matches in “best of 3” format, up to 2 wins. As a result of the hot battle, team “Biosphere” (Biosphere) became the bronze medalist. Silver medal award went to team “Boyovi Kabany” (ISD). Team “Full stack” (EPAM, Commerstone On‑Demand) pulled off a victory in the tournament finals and became a golden winner! Following the tradition of previous year’s tournament, the participants who outperformed at the tournament also received special memorable awards. So the panel of judges handed the “The Volleyball King” award to the best player among men – Victor Khudyayev, Team “Full stack”, EPAM. The best player among the girls and the winner of the award “The Volleyball Queen” was Daria Gordiuk, team “Strela”, Noosphere. And the title “The Young Star” (Most Promising Player) was given to Denis Levadny, team “Drunk Beards”, Noosphere. Participants were very pleased with the event and the feedback was not long in coming. “Everything was great, thank you for letting us participate in such a tournament. We received tremendous experience and pleasure. Great thanks to the organizers who accompanied us to the competitions and made the weekend the most comfortable, despite the scorching sun and hot sand. Special thanks should be given to the team of judges who passed this test together with us, as well to the host, who did not let us get bored and to the photographer! Everything was amazing and great!” – said Tatiana Prityka, a participant from Zaporozhye, when sharing her impressions about the tournament. Noosphere expresses its sincere gratitude to all the participating teams for the warm positive atmosphere and friendly competitive spirit at the tournament! Check up Noosphere Volley Beach IT Cup page to find photos and videos of the tournament. 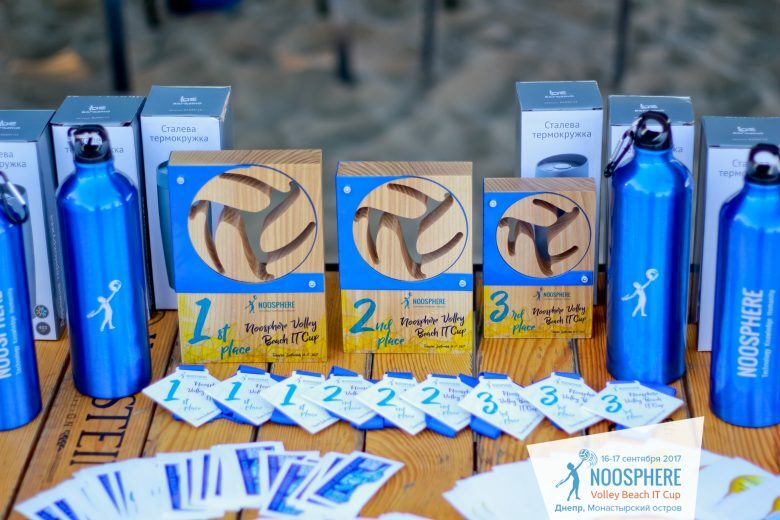 Like Noosphere page to stay tuned and not to miss your chance to participate next year at the Noosphere Volley Beach IT Cup 2018!